Four years ago, I was studying the scriptures early one morning at the kitchen table of a little rental home in Austin, Texas. My little babies (3 kids 5 and under at the time) were asleep and the house was quiet. For months I had been feeling like there was something urgent that I was not doing. 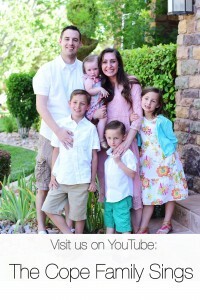 My little family had been traveling around the country, living in a new place every month. Our adventures were a total blast laced with moments of uncertainty and loneliness. (You can read about our 5 Months as Vagabonds Here) My husband, who was part of a very rigorous training program to become a doctor, awoke bright and early every day to go to work for long hours. This left many days of entertaining my littles in a new city knowing nobody— so exploring we would go! This particular morning, after months of living this unpredictable and adventurous lifestyle, I was slightly homesick and very weary. The scriptures drew me in, searching like a scavenger hunt. I needed to know what God needed me to do— I needed purpose to my presence outside of the rigors and joys of motherhood. I sat at the kitchen table with the sprinkling light of the morning beginning to chase away the shadows, lighting the terra cotta tile floor through the back sliding door. A distinct impression came to me, clear and concise— “You need to start a blog today.” I felt the urgency and I was ready to act, not knowing the first thing about such an ordeal. So naturally, I googled, “How to Start a Blog” and promptly went to work. What evolved from embarking on this adventure, is a place that I could share my heart and my passion for family, running, health and wellness, and faith. I was a big runner at the time… always dreaming of my next race. Running was my outlet for surviving the hard stuff. As my blog progressed, I quickly realized how much I LOVED sharing my heart with “the world”— aka the small community of people from all over the world that had gathered in my blog “living room”. I didn’t know these people but I felt an urgency to share whatever came to my heart. The running portion of my blog began to take over. I LOVED running, and it almost became all consuming. 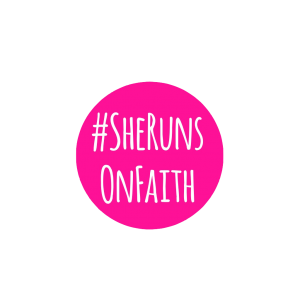 One year previous to all of this, God had stopped me from running due to a tumor in my hip after my third baby— (I share that story here) In that instance, running actually may have saved my life in a way. I was very saddened by the news— but I knew it wasn’t the end of the world. No, the end of the world came gradually as my pain got worse. (Read more about my struggle here) Try as I might, “taking it easy” with the soul care of four little kids (8 and under) while my husband was a resident doctor and gone most of the time— well, it was pretty much impossible. I couldn’t avoid doing all the things that were preventing me from getting better— these were things like picking up the baby, bathing children, carrying laundry baskets, bending over to get a pot to make dinner. I had to sustain life for this little family of mine, so I just kept going. God was with me through it all, though there were many times when I felt alone. Some days, my pain was so great just from doing the little everyday things– I wanted to give up. Desperation was high and my heart became so low. I didn’t feel like I could turn to anyone (which wasn’t true, but I was trying to do it alone). My whole identity had been questioned. I didn’t know if I would run again— but I didn’t care at all. I just wanted to walk without pain, to be able to run and play with my kids again. I longed to hold my baby without pain. My blog was dormant. I had nothing to say. All the light and truth and knowledge I could muster, I couldn’t give to anyone—-because I NEEDED IT. Oh how I knew that I needed Christ. Only He could fix this. I was desperate for His help. 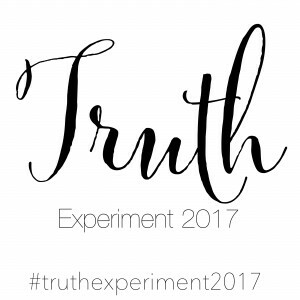 So I began something called “Truth Experiment 2017”. This was a place where I would share truths that I had come across. Things that I had felt and prayed to know for myself if they were true. This project dwindled after 19 days of consistent and vigorous daily gospel study and posting. But in those 19 days, my heart started to wake up again. The glorious light of Christ began to fill my soul. His word began to give me more hope than I had previously had. My best friend reached out to me every so often during this hard time. She would ask how I was doing, and with all the cheer I could muster, I would reply, “I am doing pretty well!” and then quickly change the subject. She knew I was struggling. And unbeknownst to me, she was praying for me. She was petitioning God to help her to know how she could help me. In her words, she said, “I had a thought one day. I recalled all of the songs you used to write in our growing up years” (songs filled with teenage angst, mostly haha) She continued, “I always LOVED those songs and wished I had them on a CD to listen to whenever I wanted. 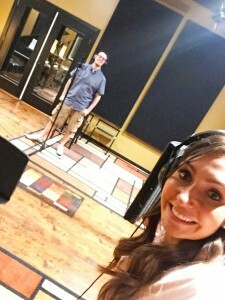 When I thought of that, I knew that was it, you needed the healing power of music.” When she told me to start writing music again, I laughed out loud and thought, “yeah right”. But her comment about the “healing power of music” really stuck with me. So I decided to write a “Truth Experiment” about the Healing Power of Music. It was in the process of writing this piece that God put THIS song upon my heart. I couldn’t get it out of my head. I wrote the words and melody of the song in one hour. I couldn’t believe it. What was this gift that I had been given? With my limited piano ability, I created a beautiful piano accompaniment the following day. This was the beginning of my healing journey. For months I would sing and cry, sing and cry some more. This song carried me when nothing else could anymore. It was a gift from God— it was the healing strength of our Savior Jesus Christ and singing praises to Him that helped me out of my deep despair. I knew He was with me, and even though at times I had questioned that, He had been there all along. We all pass through seasons of struggle, loneliness, and despair. That is the human experience. I believe we are here on this earth to have experiences of trial so that we can grow and become stronger, deeper, and more reliant upon our elder brother Jesus Christ. 29 Take my yoke upon you, and learn of me; for I am meekand lowly in heart: and ye shall find rest unto your souls. He paid the price so that He would know how to run to us in our extremity. He paved the way so that through our refining trials, we can become what God needs us to become. But first, we have to turn to Him. That is the test. It is our choice. Will we let our trials take us TOWARD Him? Or AWAY from Him? I am stronger than before. I believe that this experience has made me a more able vessel to lift others from where I stand. If you are in the middle of your struggle, whatever it may be… please know that you are NEVER beyond the reach of Christ. He suffered and died for you and me. Listen to the words of this beautiful song, visualize yourself laying your burdens at His feet. I believe that the words “with you” capture the gift Christ has given us in it’s simplest form. “I am with you” He says in the song, and I know that is true for every single one of us no matter what. I have felt an urgent need and desire to share this message with the world. If there has ever been a need for a greater hope in Christ, that time is NOW. 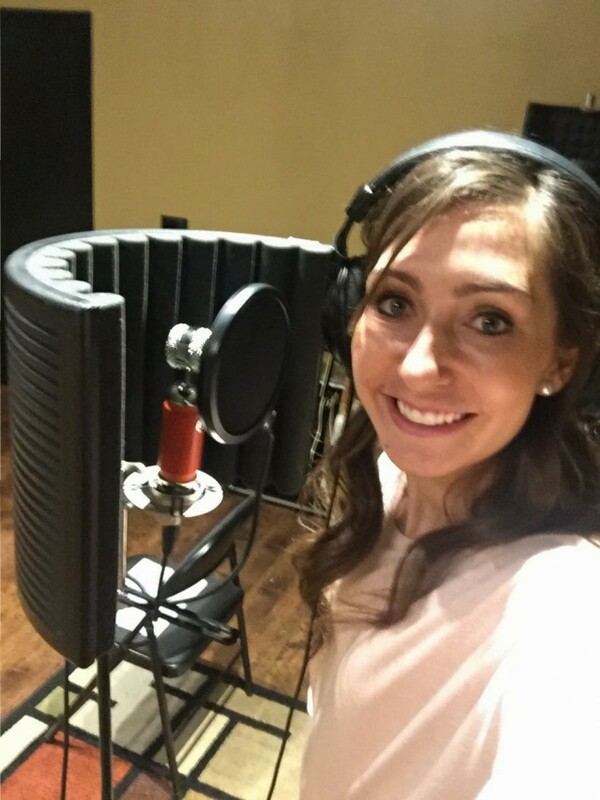 I have been holding the finished song of “He is the Christ” for two months and letting doubt after doubt and fear after fear hold me back from sharing it with you. But in the last 24 hours, God has told me three times, through the help of His children, that I need to share it NOW. I can’t ignore that. My hope is that many voices from many different faiths will share this song so that we can all come closer to our Savior together— without division, or religious distinction… that is my dream. Thank you again for your love and support. 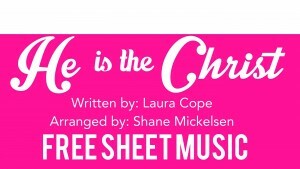 Get the free sheet music to “He is the Christ” HERE. *Special thanks to my husband Austin Cope (@derm.dad) for his help and love and support! He is singing the voice of Christ in the song and I think he did an AMAZING job! Also, I wanted to give a major thanks and shout out to @shanemickelsonmusic for his amazing arranging and recording skills!!! Couldn’t have done it without him! Thank you Jan! We love you both! Laura!!!!! WOW! Just wow. I love it.